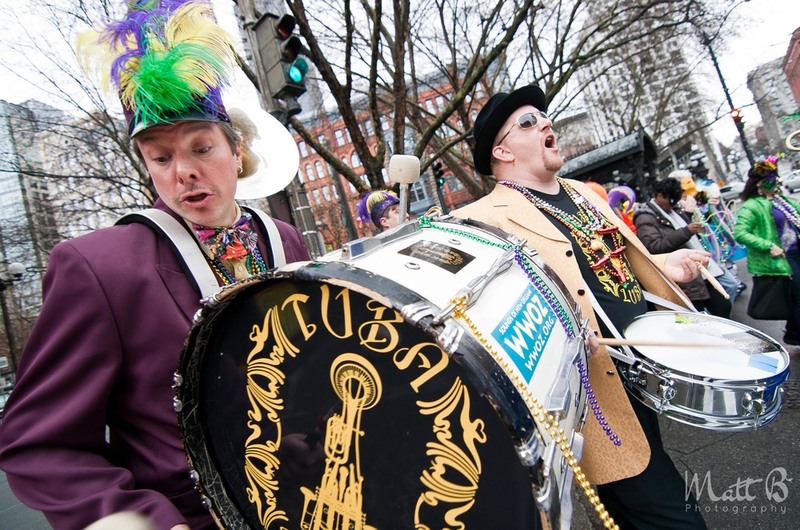 Some heavy rain didn't stop Mardi Gras in Seattle. Customers and employees at Marcela's Cookery in Pioneer Square started the party early on Fat Tuesday morning. Marcela's owner and New Orleans native, Anthony McDonald, asked me to photograph the festivities. People showed up wearing brightly colored costumes, incorporating masks, beads and hats, and even some Saints gear. A six-piece brass band was on hand to liven things up. At noon, they took to the streets, starting a parade down 1st Ave. Party-goers passed out beads and even crashed-in on a few local businesses. The parade culminated with a dance party outside the restaurant as the band played on. It was a fun, positive celebration, and I was glad to be a part of it.